SKI RESORT OPEN from 15 Dec 2017 to mid-April 2018 - very good snow record with groomed pistes guaranteed. New snow cannon installed on piste outside chalet enable skiing to main ski lift in the town during high ski season. Outstanding snow in 2016/7 season, expected to stay that way in new ski season - as always (new snow cannon + new fast lifts = no queues). A feature of this self-catering apartment is the size of the accommodation: 57 sq.m. is considerably larger than most comparably priced. Ideally situated approximately 4 km from the motorwayA40/TGV and 300 metres above the town's main gondola; the chalet can offer doorstep skiing in High Ski Season (February). The chalet (with its own lift and parking) is in an area with magnificent views over the town and to Mont Blanc. These can be most appreciated when lounging around the main feature - the private, outdoor, heated swimming pool in Summer (very few chalets in this area boast this facility), or skiing the Evasion area in Winter. The chalet offers very easy access to many ski resorts: Megeve, Chamonix, les Houches, Argentiere, Flaine, Combloux, les Contamines Montjoie, and even Swiss and Italian ski resorts are all within one hour's drive. The traditional Alpine-style chalet has timber-clad walls that keeps the apartment cool in Summer, yet warm in Winter. The apartment is particularly suited to families and is situated in a quiet, yet convenient, area a short distance from the town centre, restaurants, cafes, bars, skibus and shops; all within ten minutes. St. Gervais les Bains: St Gervais was traditionally a fashionable spa town - attracting tourists since 1806. Today, after much regeneration in recent years, it is popular with families. It retains much of its charm alongside modern facilities and very extensive skiing. With the summit of Mont Blanc rising within the commune of St Gervais, the village boasts the most extreme altitude difference in Europe: from 580m. to 4,810m. The presence of Mont Blanc presents a unique panorama; the best views are obtained from the town, on the slopes facing the mountain, the drive into the town or on walks in the meadows above the ski station of Le Bettex. St. Gervais is an ideal base to explore other areas within easy reach: the historic skiing and mountaineering town of Chamonix; the pretty little town of Courmayeur in Italy (via the Mont Blanc tunnel or the cable car from the Aiguille du Midi in Chamonix); the beautiful, ancient lakeside town of Annecy; the exquisitely chic town of Megeve (the most stylish resort in the Alps), the cosmopolitan, lakeside town of Geneva and the spa town of Evian les Bains - all not to be missed. Saint Gervais boasts a recent renovation to its sports complex with a newly refurbished heated indoor swimming pool complex (including sauna, hammam, etc. ), so you can enjoy mountain views while swimming in the depths of Winter! The ice rink regularly hosts national and international events, including ice skating galas (regularly featuring French champions and international stars) and ice hockey matches that host the local team, HC du Mont-Blanc, who play to a high standard in the French Second Division (2017 season runners up). Winter: An extensive range of activities is available: skiing, snowboarding, walking, ice-skating, mountaineering, heli-skiing. The terrain is suitable for all abilities - children readily welcomed. The pistes are mainly reds and blues, but for experienced skiers there are challenging blacks. Beginners are well-catered for with two ski schools. The linked areas (Evasion Lift Pass combines St Gervais, Megeve, Les Contamines, Combloux, St Nicolas de Veroce) offer a total of 420 km. of groomed, un-crowded pistes served by 116 lifts on one pass. Snow cannon ensure the resort stays open all season. It has a snowpark with a half-pipe, jumps, etc. ; other skiing includes: snowblading, cross-country, slalom, telemark, ski-touring. Skiing on the Mont Blanc side is served by the Mont Blanc Tramway (TMB) - the highest train in France, a funicular (starting in Le Fayet and passing through St. Gervais) rising to a col linking with Les Houches. Apres-ski can be enjoyed in the many bars/brasseries; there is also a good choice of Savoyard restaurants, pizzerias, cafes, cake shops - even a late-night disco and casino. Summer: Activities range from walking, mountain-biking, golf, tennis, swimming/water-sports (there are lakes and bathing 'beaches' locally in Sallanches, Passy and Combloux: some fed by mountain water! ), horse-riding, fishing, hot-air ballooning, parapenting (jumping off the side of a mountain with a parachute! ), shopping, etc. In fact, most summer activities are catered for locally. One of the most popular is taking the gondola lift from the town, walking in the fields above Le Bettex, taking in the breathtaking views towards Mont Blanc, while stopping off at one of the mountain restaurants that open in the summer. At the end of the day, there is also the prospect of cooling off in the chalet's open-air, heated swimming pool. The bathing lake at Combloux (5 min by car) is spectacular - a 'biotope' with water fed from a mountain stream, filtered naturally by plants and heated by the sun: it has unrivalled views of the permanently snow-capped Mont Blanc and the jagged peak of the Aiguille du Midi. Megeve has a fantastic, modernised sports' complex which has undergone extensive improvements in recent years (10 min by car) including indoor swimming pools, an Olympic-sized outdoor swimming pool with flumes, sauna and steam room (hammam), climbing wall, tennis courts, mini-golf, table tennis and an indoor ice-rink; there is an outdoor ice-rink in the centre of Megeve in Winter, too! Avid skier; love walking in the mountain fresh air; love great views from chalet. love the Summer sun and the Winter snow. Fantastic family-oriented, child-friendly town with a village appeal. Much effort by Mayor and council to update the town. Local and regional produce market every Thursday. New innovations - e.g. bridge to cut journey time through town - that help modernise town. Great location as a base to explore the mountains and beyond to Switzerland and to Italy. Motorway links are fantastic; chalet is just 15 minutes from end of Autoroute Blanche (A40), which links to the whole of France. Family-oriented chalet, open air swimming pool with fantastic views, far enough from town to be secluded, but close enough for quick trips to the bars and restaurants, very friendly town, locals willing to help and speak French to you, plenty to do in Summer and Winter - not just a ski resort, but a working town giving the full flavour of France in the Alps, truly magnificent views of Mont Blanc, especially from the ski slopes. Fully tiled with wash basin, full size bath with overhead shower attachment, bidet. Hot and cold water available at all times. Electric shaving point. Automatic underfloor heating in Winter when temperature drops, which can be supplemented by electric radiators in the apartment. Clothes airer can be placed on the balcony. WiFi available in the chalet on top floor: comfortable seating area in lobby entrance for internet users. WiFi code available on request. Large lounge area with corner settee and sofa-bed; seating for 7+. Television with full free digital channels for region. Large family-sized refrigerator with small freezer compartment inside. 4 ring ceramic hob (easy clean ceramic: clean spills immediately hob has cooled with damp cloth). Electric floor-standing double oven: top oven with grill; bottom fan oven. Medium sized microwave oven available. You will need to supply your own food and drink. You may find previous renters have left simple items like: toilet/kitchen roll, salt/pepper, etc. Please leave a small supply of toilet roll. All necessary plates, cutlery, bowls, dishes and kitchenware: cooking untensils and saucepans supplied in pine dresser. Suitable for family of 7 plus. Dining table and seating for family of 7 plus. Player shows all DVDs, but not Blu Ray discs. Small selection of novels. Previous renters occasionally leave current magazines, etc. Selection of board games: suitable for both children and adults. Selection of DVDs: range of DVDs available, but you can bring your own. TV has facility for gaming input. Balcony can accommodate a small table with seating. In Summer, canoes can be rented in Le Fayet. Lockable storage is available on request to the Gardienne. In high season it is possible to ski back to the apartment on non-pisted route from station (Le Bettex) above St Gervais and ski down to the main gondola lift in St Gervais using piste outside chalet. Local tennis courts can be booked in the town. Nearest golf course is in Megeve: Summer only! Ramp for wheelchair access from the car park down to chalet; lift in entrance lobby takes you down to second floor and is ideal for wheelchair access. Smoking is not permitted inside the apartment by regulations, so only smoke on the balcony, please. Exclusively for residents: open-air, heated pool available from mid-June to mid-September. Decking area for sunbathing and fully enclosed for security. Grass area around pool can also be used. 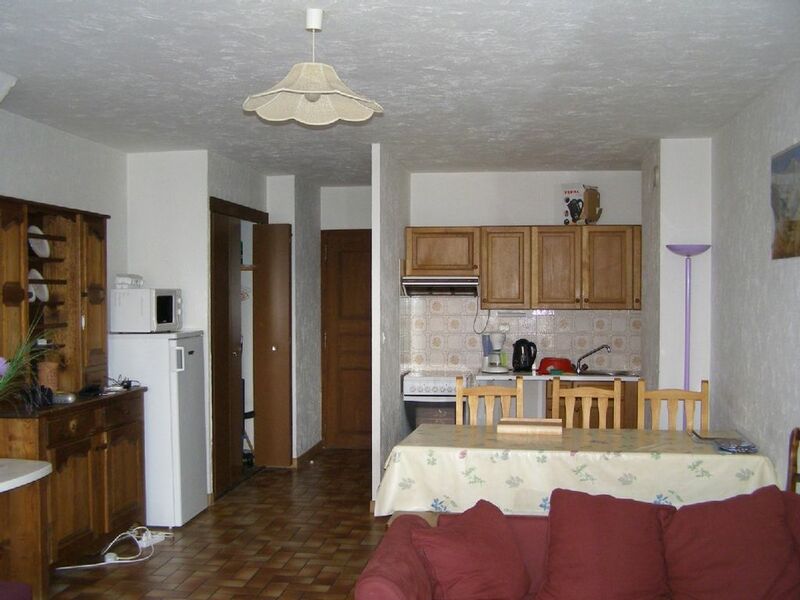 Great size apartment for a family in a fantastic location for skiing. We loved our stay at the apartment. It is huge and in an ideal location for access to the slopes in the morning and coming home at night. It can be a bit of a trek into town down the road, especially coming back with small kids, but the town of Saint Gervais is beautiful, surrounded by the mountains and the town itself is very pretty with some great places to eat. Karen was very easy to contact and replied with all of the info we needed. I would definitely recommend the apartment and the area. A couple of notes, while there is a shower there is no shower curtain, so it can get messy. Also, there is WiFi for the whole chalet, but in the apartment it only works by the front door. If you want a decent signal then you need to go up to the lobby. All in all though very enjoyable. Thank you, Paul, for the review. Very fair comments, and we are glad of your recommendation. We intend to install a shower screen; it is one thing we must do on our visit at Easter. Generally, though, we have found people prefer a bath, as there is plentiful hot water, and it is always on tap. We will be making various updates in due course, too, including a new carpet in the double bedroom. The location is ideal in High Season, but the return piste gets worn later in the Ski Season, though. I appreciate the walk to the town may be a bit much for very young children, but for adults it is a fair work out! We love the area, the pistes are relatively uncrowded in Winter, and it is great in Summer, too, with the swimming pool and exceptional views to Mont Blanc! WiFi is provided for the residents, but, yes, the access is best from the Lobby on the top floor; there is talk of extending the coverage, but it is pricey to do so, we are told! Très bon séjour, dans un grand et confortable appartement. Très belle vue, à 5 minutes du centre ville. Thank you for the kind comments, they are much appreciated. Merci pour les gentils commentaires, ils sont très appréciés. Lichtjes verouderd, maar ruim appartement, voorzien van alle comfort. Zeer vlotte communicatie met de eigenares. Gelegen aan een piste die leidt naar de lift in het dorp die je naar het skigebied brengt. Prijs-kwaliteit prima! Wij waren heel tevreden met deze woning. Alles een beetje verouderd, maar als je daar niet om geeft, dan zit je hier goed. Ruim genoeg en helemaal tegen de skilift. Je kan als het ware bij de laatste afdaling tot in je vakantiewoning skiën. La description de l'appartement est conforme aux photos : grand séjour, balcon, piscine très agréable , calme ....Il y a juste une différence avec la seconde chambre qui pour nous, ne devrait pas compter comme une chambre puisqu' elle est d'environ 6 mètres carré , sans porte ni fenêtre...... Nous avons tout de même passé un bon séjour même si les occupants de la seconde chambre manquaient totalement d'intimité. c'est idéal pour un couple avec 2 enfants. St. Gervais couldn't be easier to get to. It is at the end of the motorway network (A40: 'Autoroute Blanche') from Paris and Calais. It is 1 hour from Geneva airport with easy transfer by hire car, train or daily coach service. It is, also, at the end of the TGV rail network with direct access from Paris. Other resorts within easy reach include Chamonix, Argentiere, Courmayeur, Annecy, Geneva, Evian. St. Gervais is at the heart of its own ski area sharing its pistes with Megeve. Other ski resorts linked on the lift pass include Les Houches, Les Contamines Montjoie, St. Nicholas de Veroce, Combloux and Chamonix, itself. Golf: Courses can be found in Megeve and in Chamonix. Ski: St. Gervais is at the heart of its own ski region linked to Megeve, St. Nicolas de Veroce, Les Contamines, Les Houches - all available on one ski-pass. The 'Evasion' pass also includes Chamonix, where you can ski the most famous off-piste route of all, the nine-mile 'Vallee Blanche', by taking the cable car up to the Aiguille du Midi. The St. Gervais town tourist website is updated frequently, giving details of all activities locally. You can even book your ski-pass/lessons on-line! Apres-ski is fairly quiet and mainly family orientated; all the local restaurants - mostly serving traditional Savoyard menus - and bars welcome children. St. Gervais offers a good selection of wide, open red runs; Megeve's slopes are extensive and very pretty, many set in the woods. Both resorts are ideal for beginners, intermediates and families. You can enjoy superb untouched powder and uncrowded off-piste - hire a local guide for insider knowledge. The ski-school and child care facilities are excellent. Please email me for a Booking Form and further information on the property. Payment is accepted in either Pounds (Sterling) or Euros. For rates outside these dates, please contact us. We have a French Bank account for easy transfer of funds in Euros. Multiple weeks' rental discount available for lettings of more than 2 weeks.